Every year on 9/11, I, like most people, get teary-eyed. My thoughts drift back to that day 13 years ago when I was home from school, sick, watching the "Today Show" with my mom. It was all so surreal. Over seven years of living near the World Trade Center site has made it even more so. I visited the memorial a few times during its construction, but have yet to see it in its completed state. I also haven't had a chance to see the museum yet. Museums and memorials are hit-and-miss with me. They can often come across insincere or cold. The most successful one I've visited is Yad Vashem, the Holocaust museum, in Israel. Every part of the museum felt considered, even the design of the building. One of the most powerful parts to me was the Hall of Names. Though it only contains a fraction of the 6 million Jews who perished, there's something about seeing a physical representation of people that really affects me. On our trip to the U.K., Staci and I had a chance to visit the Tower of London's Blood Swept Lands and Seas of Red which seeks to represent each British soldier lost during World War I. I'll be honest, I don't think about WWI too often. I mean, I try not to think about wars in general, but you know what I mean. As a Jew and a girlfriend of a guy who loves the History Channel, I know much more about the Second World War than the First. 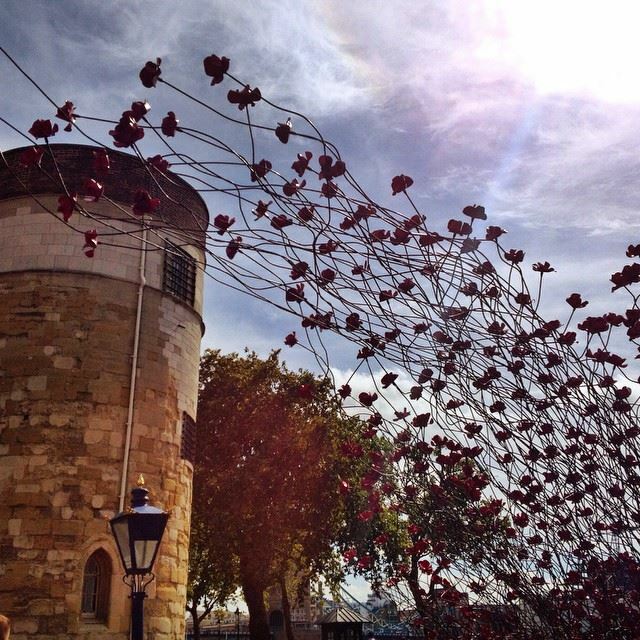 That said, seeing 888,246 ceramic poppies blanketing the tower's moat and arching over the entrance was paralyzing. Knowing that each one represented a life lost literally gave me chills. I know war is brutal, but after years of watching nightly news programming, its easy to become desensitized. Before going, I knew I was going to appreciate the visual nature of Blood Swept Lands and Seas of Red, but I never could have expected it to affect me the way it did; it stayed with me long after our trip ended. I think it affected me so much because I didn't see it as a WWI-specific piece. I saw it as a visual reminder of how cruel humans can be and how it seems we've learned nothing over the past 100 years. As we prepare for another air campaign in the Middle East, I'm reminded the world still has a long way to go. The exhibit ends November 11. If you find yourself in London before then, make sure to check it out.